When is a copy, a fake? This is one of the most amusing fakes I have ever seen. The dish is newly made to look like a late Ming "hole-in-bottom" dish. You can see it is pretty new by the black grit stuck to the foot rim, the bluish tinge on the glaze inside the foot rim, as compared to the look of the glaze outside the rim - and if you could handle the piece, by the "modern" sheen of the glaze. This new dish has then been chemically treated to look like some kind of a wreck find. The red and green "Swatow" looking decoration has been added, and the dish sanded and polished to dull the glaze and give the enamel decoration a "worn" look. Residues of the polishing paste are visibly in the pinholes of the glaze, by a close examination through a 10x loupe. Then comes the big treat - a fish is added - made of some kind of glue or plastic - with some brownish streaks muddled in for good measure. Why then have someone gone through all this trouble making a fake "fish dish"? At US $ 50-100, a late Ming genuine "Swatow red and green enameled hole-in-bottom fish dish" would have been a bargain, partly because there has never been any such before. However, would it have been worth the trouble to make only one? Not really, but with 1000 of these sold at $100, the business calculation looks different. This "Zun" vase, or Hundred Deer Jar I would hesitate to call a fake. I took this picture myself at the factory in Jingdezhen in 1991. Please notice the still wet unfired enamels on top of it, to the right, and the nice "Da Qing Guangxu Nian Zhi" (1875-1908) mark on the base. The decorator was quite nice and a very competent artist, very good at her work. She could have done anything she wanted to do. The piece is a real piece of art and I could not see that neither the piece nor the future buyer was treated with any intention of disrespect. This is part of the "mind game" I could enjoy, just like the Chinese porcelain connoisseurs always have done. Still I would have hesitated to pay the HK $4,180,000 (US $400,000) which in fact someone did in Hong Kong on May 16, 1989 for a similar vase of the Qianlong Period. I recently got an interesting picture of a modern porcelain "Wanli" copy. I found it nice, well done, somewhat charming and not really intended to deceive. It was a great contrast to the "fish dish" to the right here - a 100% downright whopping fake. I found it worth pondering. When is a copy a "fake"? Collecting is really much of a mind game - who fools whom. If a piece is "genuinely of the period it appears to be", it is normally no problem to see that at once. If it is not, it becomes much more difficult to tell "when is it, in that case, made?" It might still be interesting and collectable, even if it is made at a different time then its "face age". Replicas have always been made. Some of the best "Ming" pieces we have are made during the Yongzheng and some of the best "Yongzheng" pieces we have are made in the 1920s. Even 20th century pieces are becoming increasingly interesting in their own right, thanks to our growing understanding of them and our possibility of putting them into their correct historical context. On this subject, almost all expertise there is are in Asia today. I am personally studying the area, but will have a long way to go before I am at par with for example the Hong Kong dealers, who grew up with this kind of pieces and got to handle them when they were still hot from the kiln. When is a copy a "fake" then? When is a copy a "fake" then? Maybe we have to look for the intent. If it was made, sold, or altered with the sole intention to deceive, I think we could agree it is a "fake" in anybody's eyes. The worst case is as I see it, when artificial means have been used to age a piece. 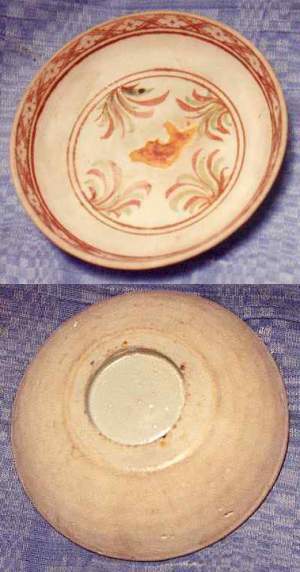 Many glazed pieces are rubbed, polished, acid treated or intentionally damaged to look "old", like this poor "fish dish". Alternatively, should we look at the scale of the business? The manufacturing and selling of "antiques replicas" is really a big export business in China, since the exportation of genuine antiques is strictly forbidden. To me, this "antiques" trade seems to be very well organized. Important sancai (polychrome 'three color' lead glazed) Tang pieces - and some of the weirdest possibly pieces - seems to be manipulated to be able to pass a TL-test. All it actually takes is the right equipment and some calibration. Somewhere out there, there are somebody right now who knows how many times you have to run a new "Tang" horse through an airport security scanner for it to be enough ionized to turn out 1250 years old when tested. The business includes all dynasties and materials such as wood, glass, lacquer, bronze, stone, jade, marble, enamels, textiles, paintings, porcelain and all kinds of pottery. Even art porcelain as late as from the 1920-30s are copied. Replacement parts or maybe whole Han dynasty pieces are carved out of genuine but worthless Han bricks turned up at road works. I have myself bought one of these "spare part" Han pieces for reference, at a fair US $25. These pieces are not possibly to separate from genuine pieces by a TL test since the bricks really are 2000 years old but are pretty easy to spot by sight. Another trick is to ground down broken shards of genuine pieces to mix them with glue for repair purposes. Something that also will pass a TL-test. Still again, new pieces are broken and "repaired" to look genuine but damaged. On a more subtle level nightly "grave plundering" expeditions are set up to give the participant the impression of getting "really genuine pieces" which of course have been planted in beforehand. 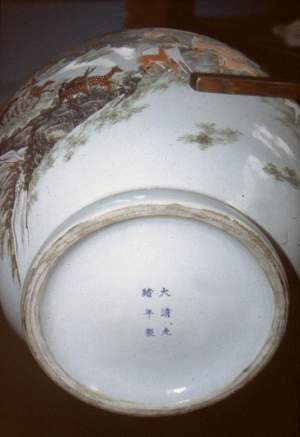 Several "Jun" pottery bowls seems to recently have been smuggled into Singapore by such a party, who was absolutely sure the pieces had been "excavated". This was told as we were to feel sorry for the grave plunderer. Maybe not my immediate feeling. In similar ways it also seems that "wreck find" expeditions are organized, where the buyer goes off with dripping wet pieces which after being properly "smuggled" home, at closer examination turns out to be not that old. I have some such at my desk right now, kindly sent to me from South East Asia. From my experience some of the pieces offered together with the fakes actually ARE genuine, but of a low quality, to make the rest of the pieces to seem more likely also to be genuine to the prospective customer. This trick are used for small and large consignments as well. What then to do about all this? Give up and collect something else? I would say no, but even I am getting pretty tired at times. The fake industry is, I would say, a bigger threat to the antiques business, than to the collectors.